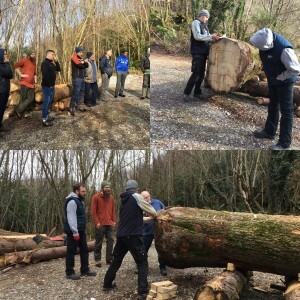 The Dugout Boat building project, led by Niall Gregory, began its journey from log to boat on the 9th March. Many thanks to the volunteers who weathered the stormy day and worked tirelessly with the heritage tools on what will be the hull of the boat. attend a safety briefing before working on the boat. Safety Briefings take place at 10am and 2pm at the beginning of the Boat Work Sessions.